Often when I'm wanting to do the color and/or sketch challenge at Splitcoaststampers, I browse my stamp sets to see what jumps out at me. 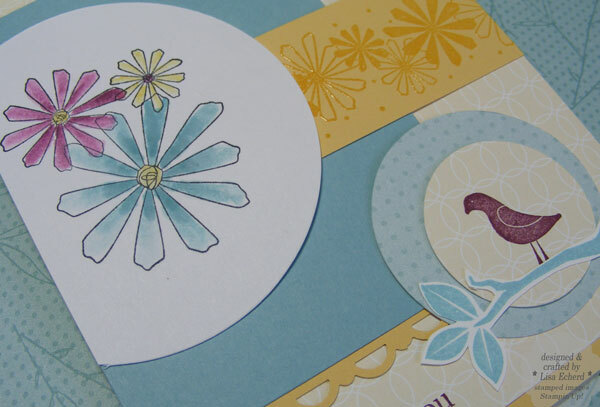 This week it was the Spring Solitude set - a hostesss set from a couple of years back with a matching wheel. I figured that little birdie would look cute in the small circle from the sketch. I flipped the sketch so the birdie would face into the card. I resisted the urge to use dimensionals on some of these elements. With no buttons or ribbon, this one is easy to mail. In fact, this card needs to go in the mail to a family friend recovering from knee replacement surgery. Such a painful process and I hope she will soon be home enjoying her independent life. The flowers are colored with blender pens dipped in Baja and Razzleberry ink as well as a So Saffron crayon. The "wheeled" image is embossed with Versamark on So Saffron cardstock. 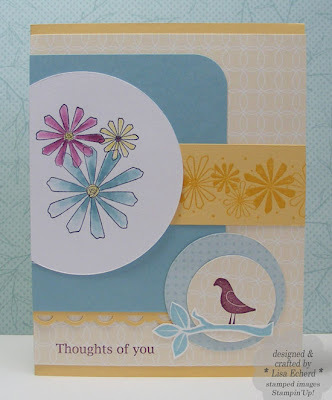 DSP: Sunshine Garden Simply Scrappin' Kit by SU!